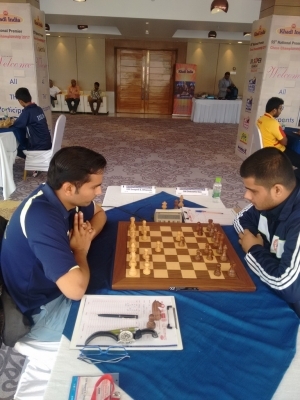 The Indian Premier Chess Championship is a round robin event of 14 players with 10 GMs and 3 IMs. 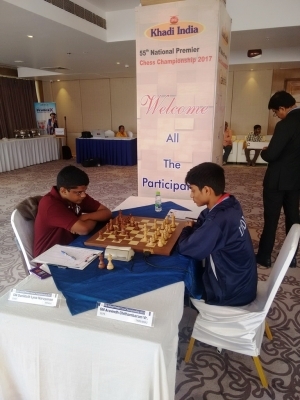 The 2016 Asian Junior champion GM Aravindh Chithambaram of Tamil Nadu stole the limelight again to stretch his lead to a full point at the end of the eighth round of the Khadi India 55th National Premier Chess Championship 2017, organised by All Bihar Chess Association at Lemon Tree Hotel, Patna today. 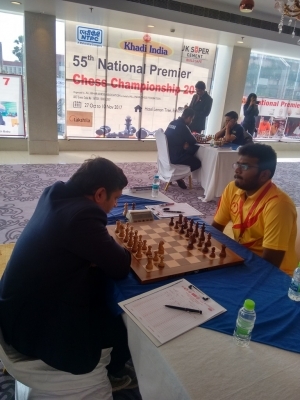 He defeated Kerala’s grandmaster SL Narayanan to increase his tally to 6 points. 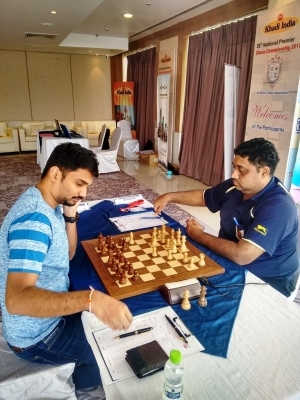 Lowly placed Railway’s international master P. Shyaamnikhil twisted the proceedings of the tournament with a shocking win over the defending champion Karthikeyan Murali of Tamil Nadu. A pyrotechnic display was expected between the two hard fighting youngsters Aravindh and Narayanan. But Aravindh started dictating terms when the opening phase of the Closed Ruy Lopez transformed to middle game. Though Narayanan’s queen, rook, bishop and knight were attacking the weak f2 square at one point, Aravindh was in no mood to exchange the pieces to reduce the crowded opponent’s pieces. 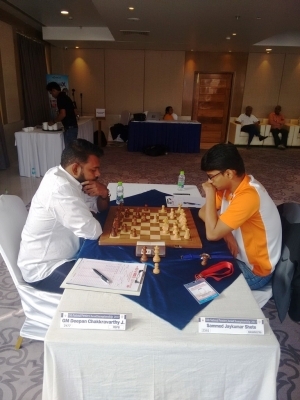 The series of assault by both players culminated in Aravindh having three connected pawns on the king side to the lone pawn of Narayanan, besides each having a pawn on a- file. Narayanan’s attempts to convert his a- pawn to a queen were in vain. Once Aravindh prevented Narayanan’s king entry into his pawn territory, the latter resigned. Najdorf variation of Sicilian defence has become a hot cake in the championship and two victories were recorded today using this defence. 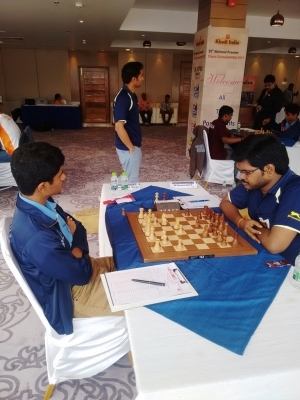 Shyaamnikhil and GM Deepan Chakkravarthy were the victors; Karthikeyan and Sammed Jaykumar Shete of Maharashtra were the victims. Karthikeyan might have been surprised, by the rook exchange of Shyaam for a knight on the 29th move. At one stage, the rook vs knight ending fetched Shyaam three extra pawns due to Karthikeyan’s improper handling of pieces. Shyaam won the race to queen the pawn first and also the well deserved point. The Railway players IM Arghyadip Das – GM Himanshu Sharma clash emanated from Robatsch Modern defence of 3 pawns attack. Though Arghyadip obtained a huge advantage by move 33 due to a couple of errors by Himanshu, he could not convert to a win immediately, due to passive play. Arghyadip’s chances even slowly diminished about 25 moves later. Only in the rook and pawns ending, he revealed his class and subdued Himanshu in 74 moves. The win puts Arghyadip in second spot in the ranking, together with Lalith Babu with five points. Former Asian Junior champion Deepan Chakkravarthy returned to his winning ways after three losses and two draws by outplaying Sammed Jaykumar Shete of Maharashtra. Sammed tasted victory in the fifth round game, wherein he castled on the queen side. A similar action today could not help him, as Deepan attacked steadily, not allowing his opponent to settle down. Sammed lost two pawns because of a series of exchanges at the advent of the middle game. Once the queens were exchanged on the 26th move, Deepan took complete command. Already on the verge of losing, Sammed committed a blunder in the final minutes of the first time control and Deepan had no difficulty in pocketing a point. Railways grandmaster Swapnil Dhopade began with the Trompowsky attack, played by Magnus Carlsen in the first game of the 2016 World Chess Championship against Sergey Karjakin. Understanding the theory very well, his opponent Odisha’s grandmaster Debashis Das accepted the challenge to get a doubled pawn on the would be castled king side. Though Swapnil had a pawn and knight to the lone bishop of Debashis in the end game, the latter had no difficulty to hold, as his bishop was controlling the promotion square from the long side. In the Kings Indian defence against S Nitin of Railways, his ICF team mate Laxman was satisfied with the outcome of the result – a draw. In the queen and knight vs queen and knight ending, Nitin had perpetual checks to his opponent’s king, forcing a draw in 44 moves. A friendly draw was the outcome in the English opening between the two PSPB players, former national champion Abhijit Kunte and 2012 Commonwealth champion MR Lalith Babu. 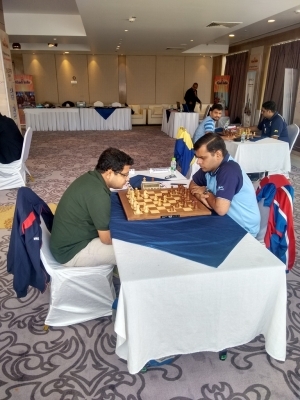 The organisers have seized the opportunity of the presence of eminent chess personalities in Patna for the Premier Championship. Players gathering in large numbers for witnessing the games were benefitted by lectures from international master Sagar Shah, a charted accountant, who has elevated the chess journalism to new heights in India, a series of training classes by FIDE Trainer TJ Suresh Kumar, Treasurer of All Kerala Chess Association and a motivating speech by Rakesh Rao, a chess player and reporter of a leading newspaper.